A sticky orange rind with a pungent and spirited aroma. The texture can vary from firm to soft and creamy depending on the season. Charles Martell moved to Laurel Farm, Dymock in 1972. He had a keen interest in the Gloucester breed of cattle and at that time only 68 cows remained in the entire world. Charles bought as many as he could, revived the Gloucester Cattle Society, of which he is now the patron, and set about making cheese with the milk. The making of cheese was not undertaken at first for the cheese itself but for the publicity it might bring to the cattle. The total number of female cows has now recovered to 450 and his own herd has grown to twenty-five. Stinking Bishop is said to be derived from a cheese once made by Cistercian monks in the village of Dymock. Monks have always been associated with the production of 'washed rind' cheeses. These are cheeses which are washed in a variety of liquids. They are generally full-flavoured with lively aromas. Stinking Bishop is no exception and uses perry as its wash. It has a sticky yellow-orange rind and smells of old socks. The paste is soft and creamy, the flavour is delicious and, although full and distinctive, it is not quite as pungent as the odour may imply! At certain times of year the paste becomes firmer and slightly crumbly. The cheese is similar to the famous French Epoisses which has been banned from the public transport system in Paris. In fact, at a recent cheese show in France they were amazed to discover that Stinking Bishop was made in England. The cheese takes its name from the variety of pear used to make the washing solution. Stinking Bishop pears are one of over 100 varieties which are grown on the Gloucestershire-Herefordshire border. During the cheese-making process the curds are washed in perry before being ladled into moulds. To increase the moisture content and to encourage bacterial activity, salt is not added until the cheeses are removed from the moulds. The cheese is then washed in more perry as it matures. This process takes six to eight weeks. Charles is only able to make a limited amount of cheese using milk from his own cattle. Keeping this small operation financially viable requires him to buy an amount of Fresian milk from a neighbouring farm and, because of this, Charles pasteurises his milk. 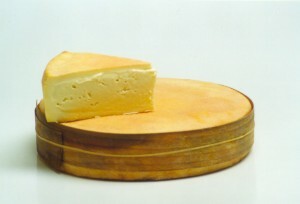 Each cheese is approximately 20cm in diameter, 4cm deep and weighs 2kg.